The famed 3 ingredient tomato sauce is nothing to shrug at. A 40-minute simmer of tomatoes, butter, and onions transforms these meager ingredients into an extraordinary sauce – one you’ll not soon forget. When I look for a new recipe, the number of ingredients involved in the recipe isn’t usually something I consider…unless it’s an endless list of ingredients that I don’t have access to. But a recipe that includes only canned tomatoes, onion, and butter? Is it a sign from above? A whisper from the inside of my pantry calling to me? Quite possibly. And frankly, I’m not going to mess with a whisper from the inside of my pantry. After 4 days of lugging my shoes around in my carry-on bag thanks to the extra weight needed for the way-more-important swag, cooking a big meal wasn’t at the top of my to-do list when I returned home from BlogHer Food ’11 this week…but a 3 ingredient sauce endorsed by Deb is one that I was willing to take on. Crack open a can of tomatoes, slice an onion in half, and dice up some butter, then let it all simmer away together for around 40 minutes and watch this unlikely combination (tomatoes and butter – really?) morph into an extraordinary sauce. The butter smooths out the acidity of the tomatoes and you’re left with a tomato sauce made from canned tomatoes that actually tastes like it was made with vine-fresh summer tomatoes. After recently finishing up the last of the 13 quarts of fresh tomato sauce I canned and froze last summer, this sauce was such an unexpectedly pleasant surprise to come from pantry ingredients. The next time this sauce makes it to my menu, I may be tempted to add a couple cloves of garlic, some basil, and a little Parmesan cheese but I doubt that I will. This tomato sauce stands strong enough on its own and I certainly don’t want to fuss with a good thing. 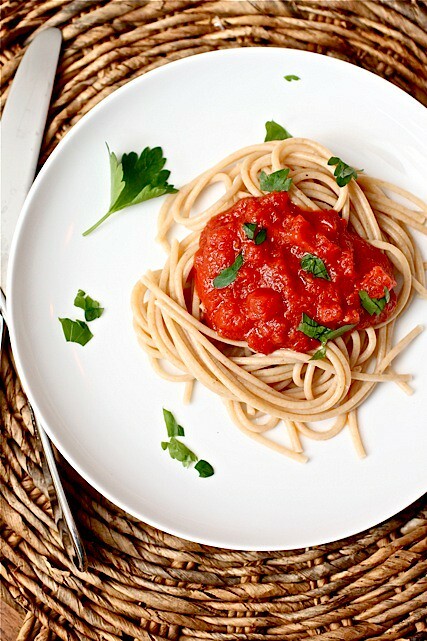 You can, without a doubt, use pureed or crushed tomatoes as I did in this recipe. Reduce the cook time to 35 minutes and don’t worry about crushing the tomatoes against the side of the pot. Put the tomatoes, onion and butter in a heavy saucepan (it fit just right in a 3-quart) over medium heat. Bring the sauce to a simmer then lower the heat to keep the sauce at a slow, steady simmer for about 40-45 minutes, or until droplets of fat float free of the tomatoes. Stir occasionally, crushing the tomatoes against the side of the pot with a wooden spoon. Remove from heat, discard the onion, add salt to taste. I have to try this! Tomato sauce always seems like it is so complicated…this does not, and I am loving that there’s butter in it because I always put butter on my pasta anyways (shhh). And the photo is beautiful. Love it! Mark Bittman had a recipe like this in the NYTimes last summer (during tomato season), but with fresh tomatoes . . . but it is a quick cook (not a 40 minute) . . . I would come home from work, start a pot of boiling water and then go out in my garden and pick some Romas. Back in the house, fresh tomaotes in hand I would start the butter melting, throw some chopped onions in the pan (I added garlic) to get soft and then wash the tomatoes and chop them up and throw them in. By this time the water was boiling for the pasta . . . I could have dinner on the table within a 1/2 hour! I did add Parm once the sauce was on the pasta. (and I usually added some pasta water to the sauce to thicken it just a smidge). I’ve had my eye on this recipe for awhile as it floated throughout the blogs that I follow. Now that *you* have made it, my dear friend, I think I shall give it a whirl. How funny that you posted this today, because I’m heading into the kitchen in just an hour or so to make this very thing! Haha. So easy, and looks so good! Thanks for sharing. OMG! This recipe is perfect when you crave for pasta while on a tight budget! I’m definitely going to try this. This is perfect for Pasta lovers with a tight budget! -people like me. I’ve made this recipe as well. The first few bites didn’t overwhelm me, but by the time I finished my serving, I definitely wanted more. Something just keeps bringing me make to that sauce!